In October 1971, Gigi Crosa, a 24-year-old student from Genoa, decided to attempt the difficult challenge of riding to the summit of Mount Kilimanjaro, 5,895 metres. Gigi had always loved travel and adventure: at 16, he rode across France on a Vespa, and in 1969 he travelled 19,000 km from Turkey to Zambia. In Nairobi, he met a group of Italians who had just climbed the mountain. Infected by their enthusiasm, he decided to make the ascent on a scooter and in 1970 began studying the mountain to find a practical route without rivers, together with his brother Nicolò, who would go with him. 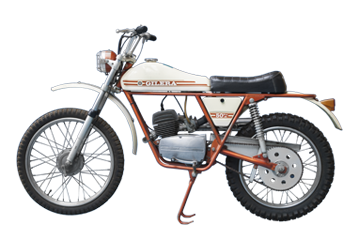 For the expedition, they were supplied with two Gilera 50 5V Trial bikes, a model yet to go into production, with a series of adaptations to optimise performance during the ascent. The exhaust was fitted with a special hot air conveyor to prevent the fuel in the carburettor from freezing; replacement sprockets were produced to exploit the power of the engine in relation to the incline, and the front wheel was replaced with a studded tyre to give better adherence to the difficult terrain. Thus equipped, the brothers left for Mount Kilimanjaro, for a three-day ascent. They began the ride at an altitude of 1,400 m and after a few kilometres were completely alone: around them, only nature and silence, and a strange feeling of freedom combined with solitude. At 3,600 m, they stopped and slept in an igloo tent at -14°C. Back in the saddle, the landscape became harsher, with lava sand and the increasingly rarefied air making it difficult to breathe. They wanted to reach the summit but decided, after six hours of riding, to stop at a height of 5,180 m. Although they failed to reach 5,895 m, the Crosa brothers broke all records for motorbike ascents: this singular trial demonstrated the exceptional technical features of the two Gilera bikes and enabled the brothers to become acquainted at first hand with a legendary mountain one reads about at school and imagines to be unconquerable. Writer and journalist Giorgio Bettinelli (1955-2008) became famous with the publication of In Vespa, his book recounting his trip on a Vespa, the first of many, from Rome to Saigon between July 1992 and March 1993. An accidental Vesparado, after that first trip Bettinelli never stopped: his travels took him all over the world, from Alaska to Tierra del Fuego, from Australia to South Africa, from Chile to Tasmania, through North and South America, Europe, Asia, Africa and Oceania. 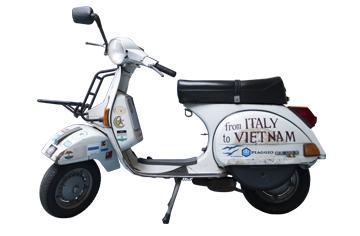 This Vespa was the scooter that took Bettinelli on his first long journey, leaving Rome in July 1992 and arriving in Saigon in March 1993 (24,000 km in seven months). Writer and journalist Giorgio Bettinelli (1955-2008) became famous with the publication of In Vespa, his book recounting his trip on a Vespa, the first of many, from Rome to Saigon between July 1992 and March 1993. An accidental Vesparado, after that first trip Bettinelli never stopped: his travels took him all over the world, from Alaska to Tierra del Fuego, from Australia to South Africa, from Chile to Tasmania, through North and South America, Europe, Asia, Africa and Oceania. 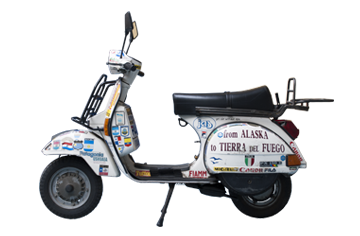 From 1994 to 1995, Giorgio Bettinelli undertook a trip from Alaska to Tierra del Fuego with this Vespa scooter on display at the Piaggio Museum. Writer and journalist Giorgio Bettinelli (1955-2008) became famous with the publication of In Vespa, his book recounting his trip on a Vespa, the first of many, from Rome to Saigon between July 1992 and March 1993. An accidental Vesparado, after that first trip Bettinelli never stopped: his travels took him all over the world, from Alaska to Tierra del Fuego, from Australia to South Africa, from Chile to Tasmania, through North and South America, Europe, Asia, Africa and Oceania. 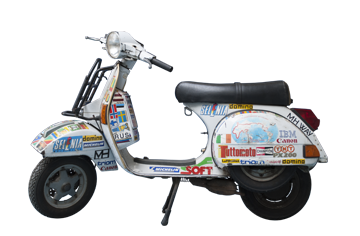 From September 1995 to September 1996, Bettinelli rode the 52,000 km from Melbourne to Cape Town on this scooter. The journey, his third on a Vespa, linked Melbourne in Australia to Cape Town in South Africa via the natural bridge of the Indonesian archipelago and Singapore; continental Asia, from Malaysia to the Sinai Peninsula and Africa from the Suez Canal to the Cape of Good Hope. Writer and journalist Giorgio Bettinelli (1955-2008) became famous with the publication of In Vespa, his book recounting his trip on a Vespa, the first of many, from Rome to Saigon between July 1992 and March 1993. An accidental Vesparado, after that first trip Bettinelli never stopped: his travels took him all over the world, from Alaska to Tierra del Fuego, from Australia to South Africa, from Chile to Tasmania, through North and South America, Europe, Asia, Africa and Oceania. 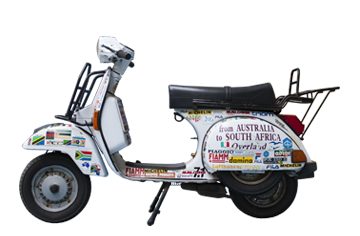 This is the Vespa Bettinelli rode for his Worldwide Odyssey: 144,000 km from Chile to Tasmania between 1997 and 2001. After leaving from Ushuaia, in Tierra del Fuego, in 1340 days Bettinelli completed a round-the-world trip, crossing the Equator four times. He rode across all of South and Central America, the USA from coast to coast, Siberia, Europe and Africa, from Morocco to Cape Town, and from there along the eastern coast to Djibouti; continental Asia from Yemen to Singapore, Indonesia, western Australia from Darwin to Melbourne, before arriving in Tasmania. During the journey, he clocked up Cape Horn, North Cape, the Cape of Good Hope and the South East Cape, using 7,000 litres of fuel and 150 kg of oil. On the way, Bettinelli was kidnapped by a guerrilla group in Congo, and released shortly after, unharmed, but robbed of all his possessions. An expert rider-traveller by then, he decided not to stop and undertook yet another journey, in the only country he had not visited: China, where he took up residence and married. 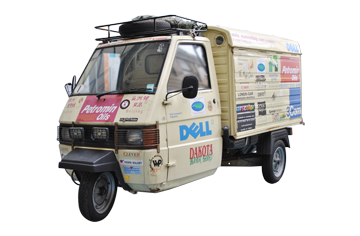 In 1998, for the 50th anniversary celebrations of the Ape three-wheeler, Paolo Brovelli and Giorgio Martino planned a journey of discovery through Europe and Asia. Riding two Ape TM 703 vans specially fitted out by Piaggio, they left from Lisbon on 30 April 1998 and reached Beijing in November of that year. The Ape three-wheelers proved to be the happy medium between two and four wheels: travelling at an average speed of 120/130 km/h, in about 200 days they travelled through 20 countries (8 in Europe and 12 in Asia), for a total of about 25,000 km of often hazardous and neglected roads. For Brovelli and Martino, the two Ape vans were like camels for the Tuareg: not just a means of transport, but a home too, and also a reliable travelling and work companion, transporting the best professional photographic equipment and a digital camera to send photos of their expedition via modem – to any part of the world – in real time. They also took a digital video camera for around 40 hours of TV-standard filming. In addition, they used a satellite phone to interface a portable computer, and used the most detailed and up-to-date maps available.